Creamy, refreshing and decadent, this crème brulee recipe is a heavenly treat that promises love at first bite. Crunchy salted egg flakes give this popular French dessert a unique Asian twist. Heat oven to 160° C.
Part A: Spread corn flakes on a baking sheet and bake until toasty, about 15 minutes. While still warm, transfer to milk and cream mixture. Stir to combine and gently warm up for 3 mins. Strain into a bowl or a saucepan, pressing to extract liquid. Discard soggy cereal. Part B: Heat up infusion mixture (from Part A), cream, and sea salt. Gradually add in vanilla flan mix, stirring continuously until dissolved. Pour into ramekin moulds and leave to set in the fridge. Place corn flakes in a large bowl and crush lightly with your hands. In a small bowl, stir together milk powder, salted egg powder, icing sugar and sea salt. Sprinkle mixture over crushed flakes and add melted margarine. Toss to coat cornflakes evenly. Spread on a baking sheet lined with parchment paper and bake for 20 minutes, until golden brown. Remove from tray and set aside to cool. 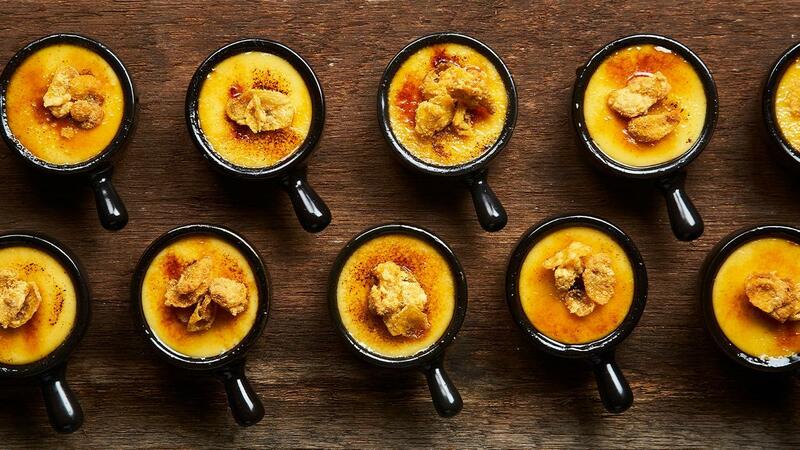 Sprinkle topping on top of burnt crème brulee. Use the salted egg crunchy flakes immediately or store in an airtight container.